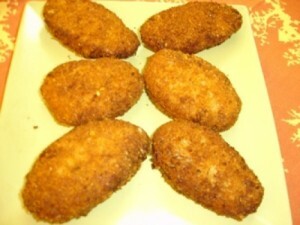 Creamy Qeema Cutlets recipe by Nazia Nazar at DesiRecipes.com. Place the Qeema in a cooker and pressure cook for few minutes. Heat oil in a pan, add chopped onions, chili powder, gingergarlic paste, turmeric and fry for 2-3 minutes. Then add kheema and cook until it gets separated. Heat oil in a separate pan, fry the maida flour for 2 minutes. To this, add warm milk and cook until it thickens and looks like mash potatoes. Then add kheema mixture to the maida with salt and remove from heat. Make round balls and press to an oval shape, apply beaten egg and then bread powder and deep fry in oil until they are brown. Serve with onion and cucumber pieces.